See how the Telegraph Media Group was able to use quick load balancing for thousands of photos on a daily basis - saving both time and resources. Learn how to secure your modern web applications for continuous delivery. Look at the State of Load Balancing 2019 with key trends in analytics and automation. Take a deeper look into deploying container application services with Kubernetes. Swisslos manages jackpot web traffic with intent-based application delivery network. Learn more about Avi's SaaS solution for an easy onramp to multi-cloud application services. Avi introduces the industry's first and only SaaS solution. This IDC market perspective provides an overview and analysis of the open source Istio service mesh and the ecosystem that has formed around it. Avi delivered load balancing and analytics for Swisscom's OpenStack-based NFV cloud . Use Red Hat OpenShift to better manage and orchestrate microservice deployment. Discover how Nuage Networks and Avi offer a scalable and secure multi-cloud SDN platform. Learn how Cisco Tetration Analytics and Avi Vantage help enterprises deliver app visibility and security. Learn how to migrate 75% of F5 iRules to native point-and-click policies. Are Legacy ADCs Holding Companies Back? Learn how to achieve ludicrous scalability on Microsoft's Azure cloud platform with Avi. Learn how Avi and Splunk help deliver better analytics and operations. Deploying Avi Vantage on VMware Cloud on AWS brings speed and simplicity to app delivery. Abandon decades-old TCPdump and say hello to intuitive real-time analytics. Learn about zero code multi-cloud automation leveraging Ansible and Terraform. L2-L7 network automation makes Cisco ACI easier. Learn the best practices for automating load balancing on Microsoft Azure. Learn how to improve your global server load balancing strategy with Avi Networks. Migrating to the cloud means bringing existing applications to the cloud, NOT legacy appliances. Smart Load Balancer gets new features to improve elasticity, automation, and security while Legacy Load Balancer concocts a devious marketing campaign. Unravel capacity planning pain points with legacy load balancers. Never overprovision again. Legacy load balancers have to go in HA pairs. Find out how smart load balancers offer availability differently. Fortune 100 company empowers mobility customers with cloud-based analysis. Retailer reduces OpEx by >30% by eliminating overprovisioning. Agency secures, simplifies, and streamlines app infrastructure. Enterprise accelerates app deployment with 100% REST API, self-service, and elastic ADC. Enterprise simplifies multi-cloud app delivery with a single ADC solution. Avi Networks helps quickly narrow down typical issues seen with web applications. Learn how to unlock the potential of hybrid and multi-cloud environments. See how we deliver flexible application services beyond load balancing. Learn all about the zero-code approach to automation with Ansible. Tutorial 1: Deploy a Service Mesh for OpenShift-Kubernetes clusters. Tutorial 2: Learn how service discovery works in OpenShift-Kubernetes clusters. Tutorial 3: Deploy production-ready container apps in OpenShift-Kubernetes clusters. Ranga of Avi and Craig McLuckie of Heptio discuss architecting for operational stability. Learn how Avi and Cisco deliver application services for modern cloud-native applications. Understand the challenges of using virtual load balancers to meet business objectives. Learn how Red Hat OpenShift and container networking create robust microservice applications. EBSCO shares experiences he wished he had before starting his OpenStack journey. Watch a performance test of software load balancing on the Google Cloud platform. Learn how a software-defined load balancing architecture helps scale your applications. Discover how to deliver consistent load balancing across multi-cloud environments. Software load balancers help with analytics and application performance monitoring. Best practices for building and managing Mesos clusters using application services. Learn about on-demand auto-scaling, service discovery, and micro-segmenation. Discover how software load balancing helps organizations reduce TCO for load balancing. Avi and Cisco ACI simplify deployment with one-click service insertion and zero-touch scaling. Supercharge your application services using software load balancers. Learn how to deploy production-ready applications at enterprise scale with Avi and Rancher. EBSCO automates its multi-cloud app strategy to deliver continuous innovation and save time. Learn about how Time Warner leveraged OpenStack LBaaS to deploy Mesos Marathon. Deep dive into Avi Vantage architecture and how Avi delivers scalability, multitenancy, and simplicity. See how Avi uses end-to-end timing and anomaly detection to monitor app health and improve end-user experience. See how easy it is to deploy the Avi Networks Cloud Application Delivery Platform with end-to-end SSL in your OpenStack environment. 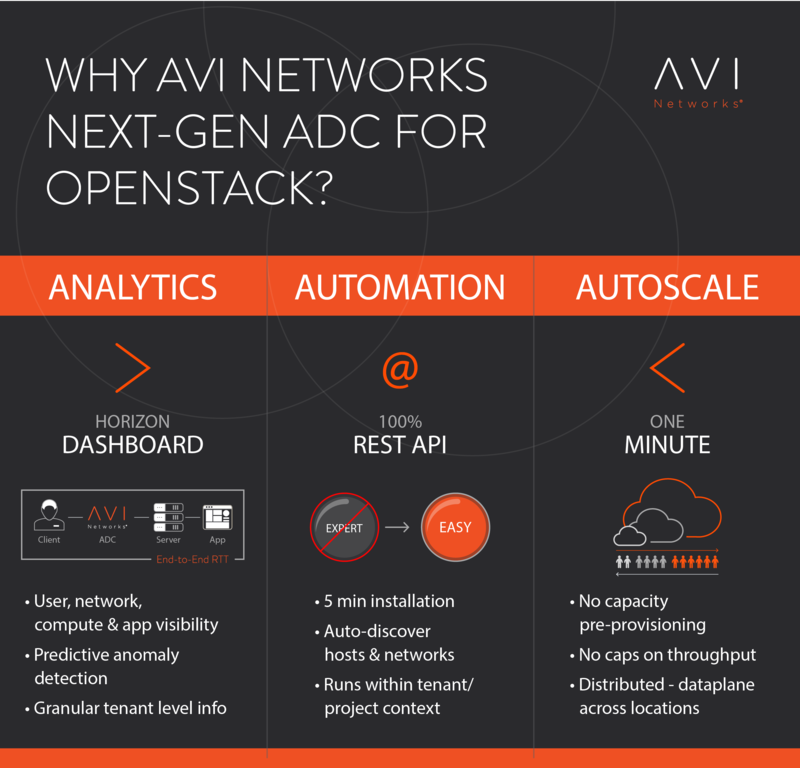 See how Avi delivers enterprise-grade, software load balancing, and real-time analytics for OpenStack. Learn how Avi delivers load balancing, app maps, app performance monitoring, and security for Mesos. Learn how software-defined load balancing for VMware environments drives automation, security, and ease of use. Time Warner deploys enterprise-grade load balancing and app delivery for its multi-data-center cloud. Learn how Avi and Juniper Networks deliver L2-L7 automation, visibility, and security for enterprises. Learn how the Avi delivers software-defined load balancing, autoscaling, and analytics for VMware. Understand how Avi deploys apps 5x faster on the Nutanix Enterprise Cloud. Avi Networks partners with VMware to bring a complete network automation solution in partnership with VMware NSX. Learn how Nuage and Avi deliver a software-defined approach for network and app services. See how Avi and Cisco ACI drove data center innovation. The combination of Avi Networks and NSX enables Avi Controller to be the single point of management via REST APIs. The 3rd largest US retailer struggled to meet its business SLAs –until it incorporated Avi Networks' Vantage platform, that is. Visualize how Avi provides analytics, automation, and autoscaling for OpenStack environments. The shopping season can be the ultimate stress test for your app environment. Is your load balancer ready for the strain? Ranga Rajagopalan, CTO and Chief Architect at Avi Networks, spoke at OSCON 2016 (O'Reilly's Open Source Conference) in Austin, TX. Avi iWAF: Why did Avi build it? This video sets the context around why Avi developed a Web Application Firewall (the Avi iWAF). Proxsys Netherlands, a leading Dutch service provider, leads data center innovation with Avi Networks. This demo video provides a product overview of Avi iWAF (Intelligent Web Application Firewall). Learn how Avi Networks delivers premium elastic load balancing for applications deployed in OpenStack. Learn how to deliver application services including service discovery, analytics, and micro-segmentation for container applications. Learn how to deploy scalable app services in Microsoft Azure. See how Avi deploys autoscales app and sends "spillover" traffic to the public cloud. A short overview and demo of how Avi load balances Azure apps. Learn how you can migrate to Avi with Cisco CSP 2100 and the Cisco NFV platform. Learn how to ensure continuous delivery of cloud applications. Learn how to achieve compliance with HIPAA/GDPR/PCI DSS while securing your web applications. Review a step-by-step guide to setting up scalable application networking services in Microsoft Azure. See how your enterprise can achieve elasticity, security, visibility, and analytics with Avi and Azure. Learn how to simplify your analytics and operations with Grafana and Avi integration. Learn the difference between smart load balancers and legacy load balancers. Edward Sharp (Chief Strategy Officer, Avi Networks) talks about the need for public-cloud-like-simplicity from load balancers during Cisco Live US 2017. Enterprise accelerates app deployment with self-service and automation. Review a study of the application delivery controller and load balancing market. DGDean modernizes infrastructure and accelerates IT services rollout with fast time to market. Migrate your Cisco ACE to the Cisco Cloud Services Platform with a software-based approach. Fortune 100 company reduces troubleshooting time from months to minutes. Learn how to defend your workloads with a distributed web application firewall. Our Knowledge Base hosts documentation on Avi Architecture, Features, Guides, Release Notes, Support, and more. See how the Avi Vantage Architecture effects application performance, speed, security, flexibility, and more.